A clean, bright creamy yellow bag is the perfect option for a color coded flavor range when considering Parmesan & Garlic. The perfectly sized logo (not too big, not too small), pops well and the positives, such as Gluten Free, All Natural, 0g Trans Fat etc., are well placed at the top. These were a lot like regular Potato Chips for us. The Kettle Cooked nature of this type of Chip invariably means the slice will be somewhat thicker, but this relatively thin version allowed for a crispy snap type crunch rather than a hard and firm biting crunch. It is always nice to see potato skin on the edges of Chips, it provides a healthy and fresh feel to the snack. The hot oil produced bubbles on the surface of most Chips were notable, as was a relatively grease free powdery residue, presumably from the garlic and Parmesan seasoning. The Nose Plunge Test revealed a slightly garlicky aroma when the bag was opened. The flavor seemed a little creamy, which was arguably the Parmesan, but may have been a little to do with the sour cream seasoning that was included but not mentioned. 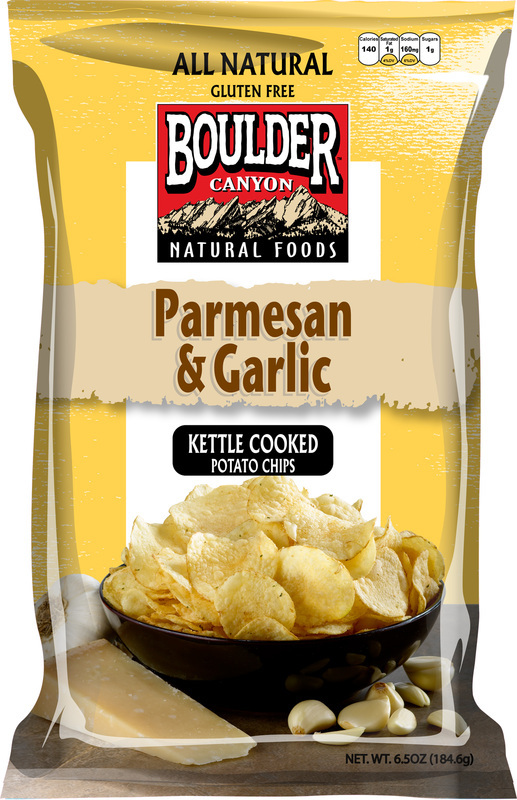 Garlic is a seasoning, like salt or pepper, which often brings out a flavor, but these just had a mild, pleasant slightly cheesy, slightly tangy flavor.